The history of third level airlines in New Zealand is typified with airlines finding a niche for their services and for ways to expand their services. They often hoped, largely in vain, for NAC and Air New Zealand to withdraw from routes which they could then pick up. By 1970 NAC had only dropped its South Westland service, but, in 1970, with the decision to replace the Douglas DC-3 service from Auckland to Whangarei, Kaikohe and Kaitaia with a Friendship service the Corporation announced that Kaikohe would lose its air service as the aerodrome and approach were inadequate for Friendship services. 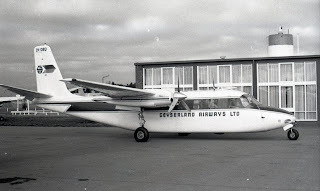 In July 1970 Rotorua-based Geyserland Airways were successful in picking up the rights to fly to Kaikohe gaining a licence to operate an Auckland-Kaikohe service with an Aero Commander 680FL. 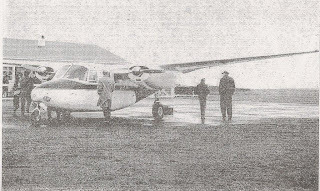 The new aircraft, bought for the Kaikohe run, was capable of carrying 10 passengers and the company were confident that the service would begin immediately after NAC withdrew the DC-3 on the 20th of August 1970. 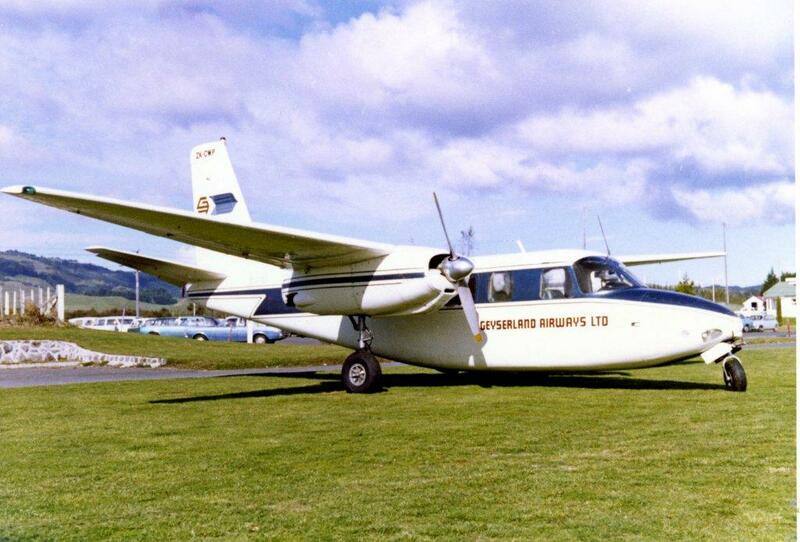 At this stage Geyserland Airways was operating a twice daily Rotorua-Matamata-Auckland return service. The arrival into the country of the new aircraft was not without incident. The aircraft, which was bought from the Kenyan Police Air Wing, was damaged in a forced landing in Ethiopia while on its delivery flight. The pilot, Geyserland’s managing director, Ian Palmer, had some explaining to do to the local authorities not only about the accident, but as to why he was flying a Police aircraft. Monsoons in India further delayed the delivery flight. The aircraft arrived in New Zealand in September 1970 and received its local registration, ZK-DBQ, on the 23rd of October 1970. 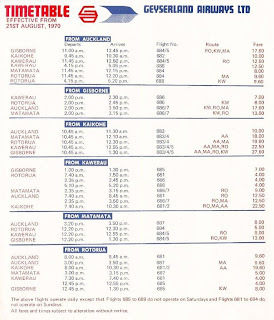 Bringing the aircraft up to standard, following its accident, was quite protracted and the aircraft did not enter service on the Rotorua-Matamata-Auckland-Kaikohe route until April 1971. 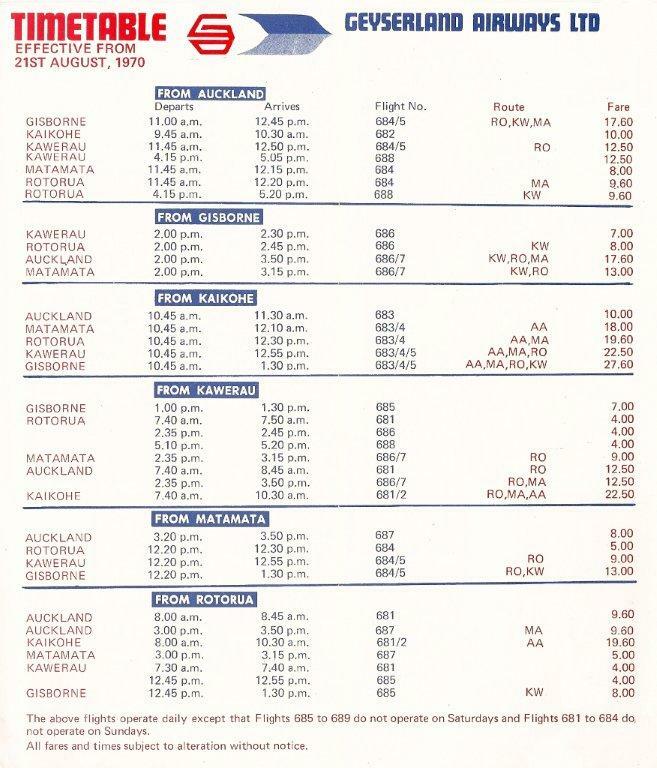 Meanwhile, the Kaikohe Bus Company were been appointed agent for Geyserland Airways. 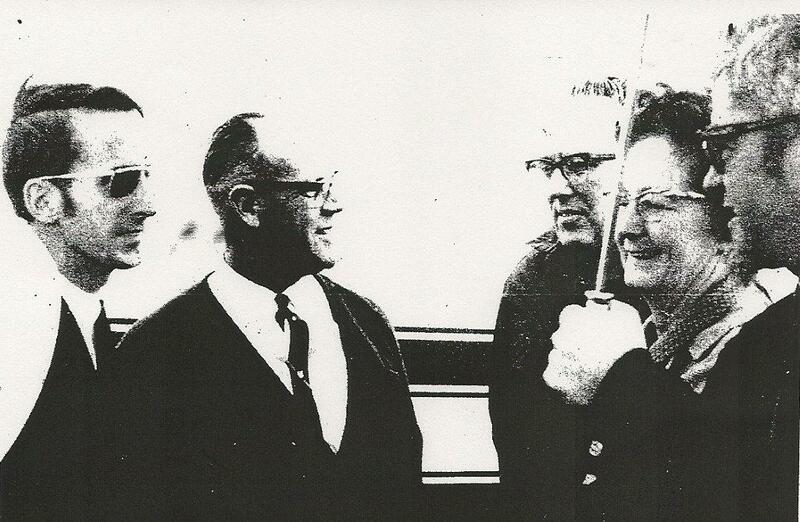 The managing-director of that company, Colin Finnerty, had been the long term travel and traffic agent for NAC’s service. 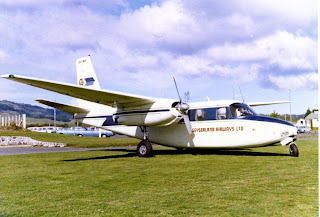 While Kaikohe residents were happy to have an air service they felt the proposed Geyserland service was “a downgraded service of light planes.” They had hoped for a De Havilland Canada Twin Otter jet-prop service to the Mid North by J. V. M. Keane Ltd. but nothing had come of this proposal. Even at this stage the possibility of an extended or new airfield at Kerikeri was being explored to meet the needs of a Mid-North air service. 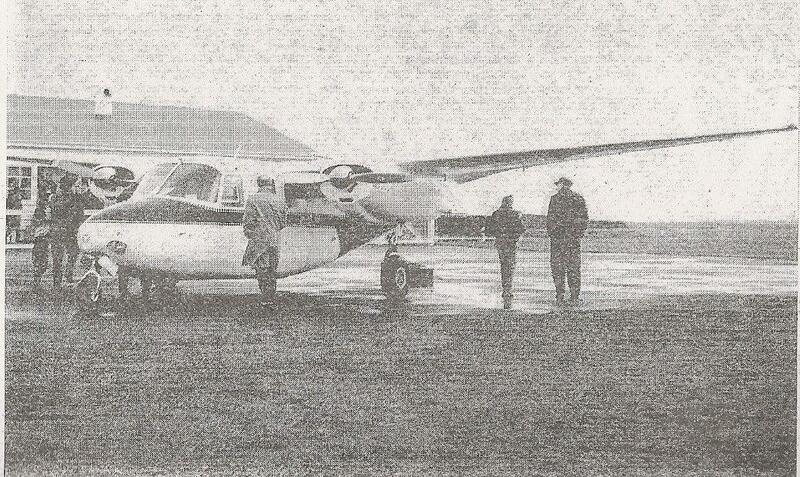 Geyserland Airway’s first scheduled flight into Kaikohe was to have been operated on Friday the 21st of August 1970, the day after NAC’s final DC-3 flight. Bad weather, however, caused the postponement of the flight until Saturday the 22nd. A large crowd of local people gathered to watch the arrival of the flight at Kaikohe which was flown by Captain S Goldsworthy in Aero Commander 500 ZK-CWP with six passengers on board. Kaikohe’s deputy Mayor, Mr O J Topliss, and the president of the Kaikohe Chamber of Commerce, Mrs Amy Campbell, welcomed the flight and silver teaspoons were presented as a memento of the inaugural flight to the pilot and the six inward and five outward passengers. The youngest passenger for the day was Bronwen Upchurch, who was 12 weeks old, and who was bound with her mother for Singapore. A month after the service had begun the company had flown a total of 108 people out of the town and 73 in, giving an average passenger loading of three in and four out on the Monday to Saturday service with the company achieving 100 per cent regularity in flights. The local agent, Colin Finnerty, told the Northern News, “Passengers were very impressed with aircraft and the informality of the service. 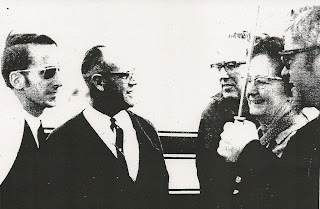 As there is no partition between the captain and passengers he is able to give a commentary on points on interest while airborne and younger passengers have expressed delight at being able to hear him radio between Whenuapai and Mangere airports.” The airline also picked up a contract to fly air mail service to and from Kaikohe. 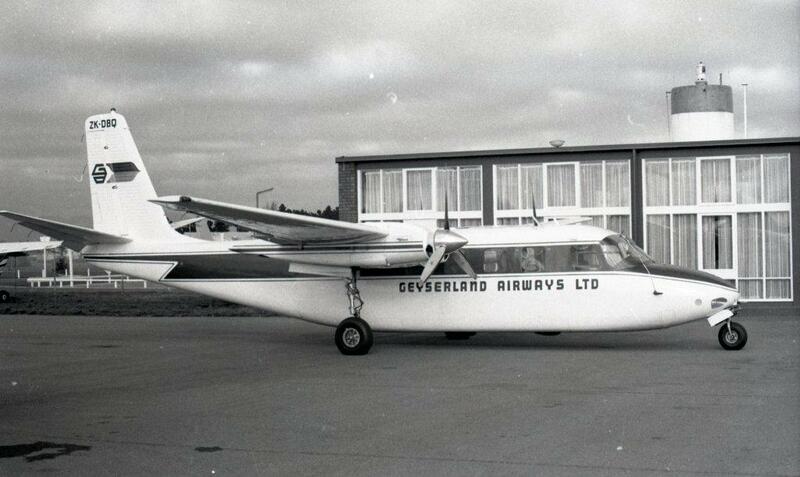 In April 1972 Geyserland Airways’ airline operation was transferred to an associated company, Air North Ltd, while the land-based and floatplane flightseeing operation remained as Geyserland Airways.